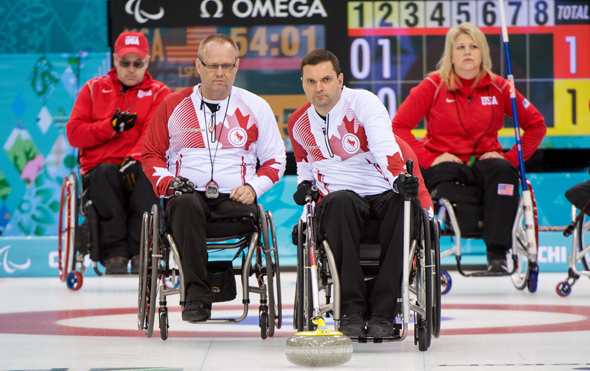 Canada defeats USA 7-2 but later drop their first game of the tournament 8-6 to Norway in Monday’s wheelchair curling action at the Sochi 2014 Paralympic Winter Games in Sochi, Russia. In today’s early game, Canada defeated a struggling USA team 7-2. 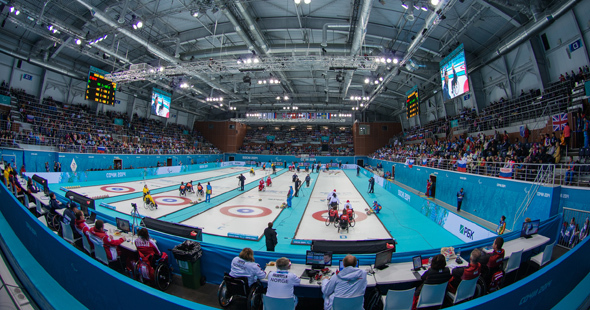 Early in the contest it quickly became evident that some of the tough ice conditions the teams had experienced in previous days had been resolved and both teams began to show their finesse early in the game. The USA team skipped by Patrick McDonald came into this contest with a 1-2 record, losing 6-4 to Slovakia and 9-5 against Korea. 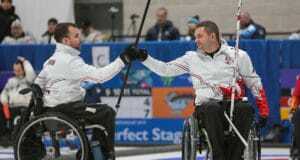 Their only win was against Norway (2-1) who Canada plays next in the afternoon match. Team Canada skip, Jim Armstrong, made good use of the faster ice on his final shot to thread the needle with a nice hit and roll that perched the counter at the top of the eight foot and Canada took charge. In the second end, USA scored one but it was in the third that Canada started to build their lead which the USA ultimately could not match. With the hammer in hand in the third, Armstrong made a perfect draw around a guard and forced USA to play a raise on the second laying stone of the Canadian team. 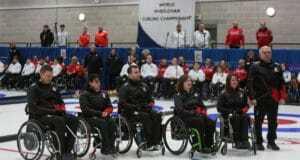 It gave the Canadian team an opportunity to play an easy draw to score two and take a 3-1 lead after the third end. Another deuce in the fifth and one point in six and seven sealed the victory for Canada with a well-deserved 7-2 victory. 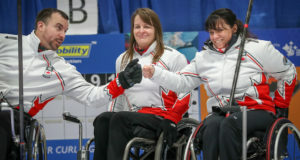 Defending Vancouver 2010 Paralympic Winter Games gold medallist Canada conceded five points without reply in the final three ends to lose 8-6 after Norway forced an extra end in the afternoon match-up. Canada led 6-3 heading into the seventh end, but the Norwegians would not go away. 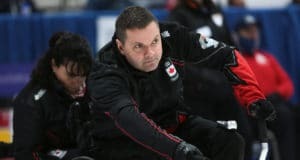 Norway rebounded with two points in the seventh and sent the game into extra ends with a stolen point after skip Jim Armstrong was unable to draw his final stone inside Norway’s closest rock in the eighth. In the extra end, Norway placed a pair of stones inside the four-foot and protected them with an array of guards short in front of the house. Armstrong was unable to break through the traffic with his final two stones, and Canada’s winning streak ended after four games.